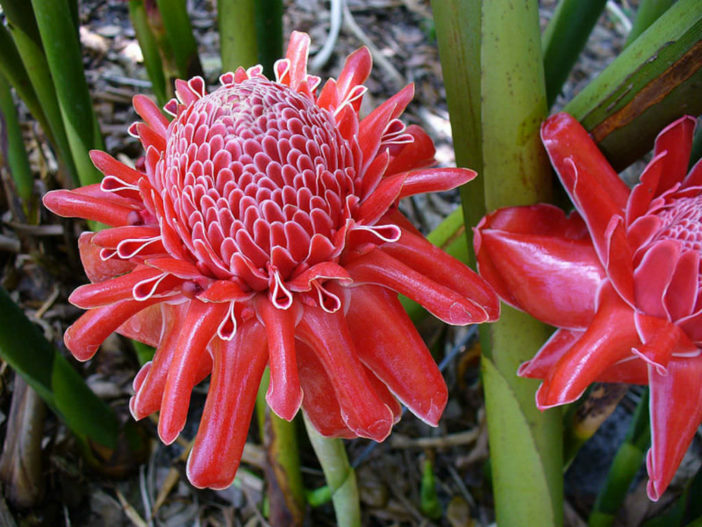 Etlingera elatior, commonly known as Torch Ginger, is known for the fiery red flowers for which it’s named. Originating in Malayasia and Indonesia, it grows in a wide range of soil types and is moderately salt tolerant in warm climates such as U.S. Department of Agriculture plant hardiness zones 10b through 11. Reaching a height and spread of 15 feet (4.5 m), Torch Ginger blooms on up to 5 feet (1.5 m) long stalks with up to 12 inches (30 cm) long, conelike inflorescences of pink or red, and is considered a tropical or subtropical, herbaceous shrub. You can propagate Torch Ginger by division of rhizomes or sowing ripe seeds. 1. Soak ripe Torch Ginger seeds in water overnight. 2. Fill a 6 inch (15 cm) in diameter, flower pot with commercial seed-germination mix. 3. Push 4 or 5 seeds into the soil, 0.5 inch (1.2 cm) to 0.75 inch (1.9 cm) deep and evenly spaced. 4. Pour water in the pot until liquid runs out the holes in the bottom and the soil is evenly moist. 5. Place the pot in a propagation chamber where the temperature ranges between 77 and 86 degrees Fahrenheit (25 and 30 degrees Celsius), or cover the pot with plastic wrap and set it in bright light in a location where the temperature is in the recommended range. Avoid direct sunlight, because the heat may make the temperature rise too high under the plastic wrap. 6. Keep the soil evenly moist but not wet. Germination takes 3 to 4 weeks. It is recommended to plant Torch Ginger in moist, organic soil in a location that receives morning sun and partial shade throughout the day. Protect Torch Ginger from cold, dry winds. Fertilize with a high-potassium, slow-release fertilizer to prevent foliage from turning brown. Sow seeds 0.75 inch (1.9 cm) deep outdoors when soil temperatures reach 68 degrees Fahrenheit (20 degrees Celsius).